The State Theater, currently located at 304 Beale Street, is a step in the evolution of theaters in Kingman, Arizona which actually began in 1907. 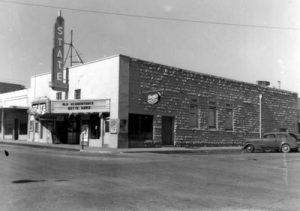 The community was first served by a theater Harvey Lang created in the Elk’s Lodge building, followed in 1917 by the Lang Theater which he constructed on Andy Devine Avenue (then Front Street). The Lang Theater closed when the first State Theater was opened by Harry Nace in 1939, and eventually the second State Theater was constructed in its current location. The theater was named by way of a local competition advertised in the Mohave Miner newspaper. The first entry sent in with the suggestion of “State” was from Mrs. E. A. Ray who won a $15.00 prize for her idea. Others who also entered “State” as a possible name won movie tickets to be among the first to experience the new theater. The State Theater had arrangements with Paramount Studios, Metro-Goldwyn-Mayer, Columbia, United Artists, Twentieth Century Fox, RKO Radio, Warner Bros., and Universal Studios to show their films during this heyday of Hollywood. Especially promoted were pictures filmed in Arizona, like “Beau Geste” starring Gary Cooper, Ray Milland, and Robert Preston and films starring Kingman’s own Andy Devine like “Geronimo”. 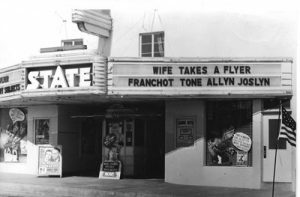 Legends of Hollywood like Bob Hope, Douglas Fairbanks, Jr., Mickey Rooney, Judy Garland, Fred Astaire, Greta Garbo, James Stewart, Bette Davis, and more had their movies presented in this theater in the magic of Technicolor and sound. The theater was equipped with the “last word in advanced stagecraft” including specially designed lighting equipment, Simplex projectors, Western Electric sound systems, and air cooling. 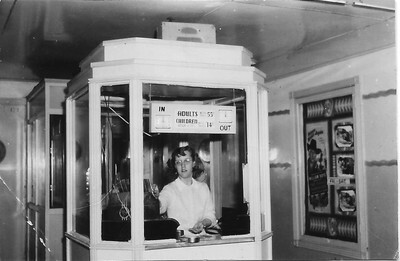 The theater was so successful and popular that it wasn’t long before it could no longer handle the volume of customers. 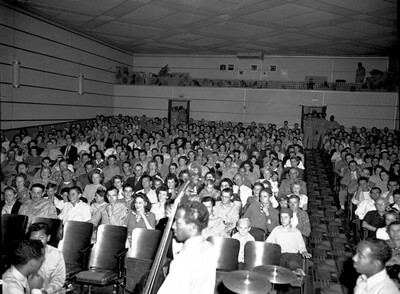 The August 29, 1946 Mohave Miner indicated that “the new cinema is sorely needed in Kingman. 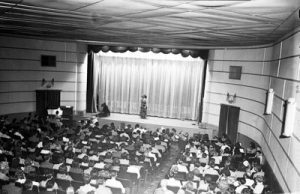 The State is catering to overflowing crowds at every performance which has resulted in very congested conditions.” The theater manager, Mrs. Ira Rawlings, made the announcement in 1946 that a new, larger theater would soon be built in Kingman by Harry Nace and the Lang movie chain. This new theater would be constructed at the corner of Third and Beale Streets, one block from the original location. The second theater would be of all fire proof materials with more seating capacity than the first. It was also to house state of the art equipment and seating. Delays in obtaining building materials caused the new State Theater to open later than planned. Perhaps the material delay was caused by the still fresh war effort. Some sources indicate that the theater opened as early as 1948. 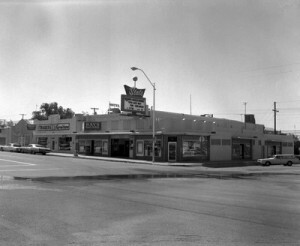 Mrs. Ira Rawlings continued to manage the new theater until 1961 when local phone books show the manager as Jason Penhallegon. Historic picture of the current theater. The new State Theater was very close to the original in interior detail. It was designed to enhance the comfort of the viewer and optimize the quality of the performance. Sloped seating helped to provide the optimum view from all of the upholstered seats. Curving side walls lead all eyes to the stage, adorned with lavish draperies. Neon lighting was used inside and out. A modest balcony provided intimate seating swelling the total theater capacity to 400 seats. Movies ran daily in this new theater until it closed in 1979. In later years the theater functioned as a local church and, more recently, as a used furniture and antique shop. Today this gem stands waiting to be rediscovered. Many of the original features of the lobby and ticketing area are lost, but its interior is still largely intact, although in need of repair. With the reconstruction of the lobby area and refurbishment of the auditorium, the projected new Beale Street Theater will be the next step in a 109-year entertainment tradition in Kingman.